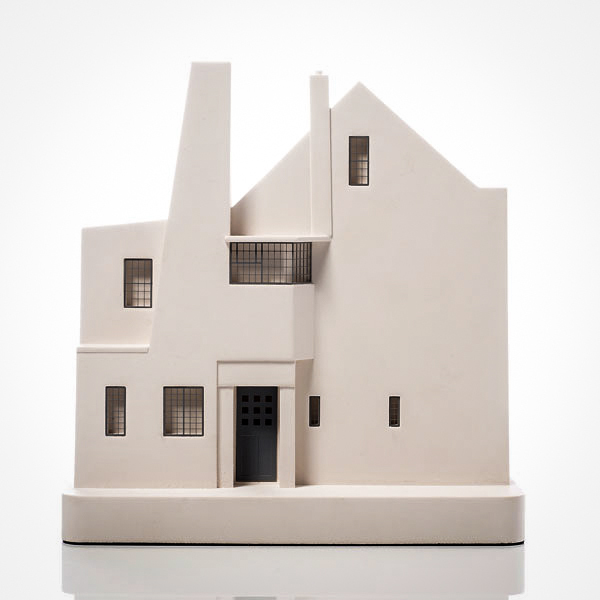 A PLASTER MODEL OF THIS AMAZING GLASGOW STYLE BUILDING. MEASURING 11IN HIGH, 6.5IN WIDE, 2.5IN DEEP AND 7LB APPROXIMATELY. FREE DELIVERY WITHIN 9 WORKING DAYS. GIFT OPTIONS AVAILABLE AT CHECKOUT. Glasgow School of Art's Mackintosh Building, "The Mac" or "Toshie" as it is commonly known, was voted Britain's favourite building of the last 175 years in a 2009 RIBA poll. It has been at the heart of the Glasgow School of Art's campus. Building work was started in 1897 to a design created by the school's most famous alumnus, Charles Rennie Mackintosh. He was a leading proponent of the Arts and Crafts and Art Nouveau movements in the United Kingdom. The Mackintosh Building is his masterwork. Unfortunately it was consumed by fire recently and its future is uncertain. Our architectural sculpture is of the slightly off-centre entrance facade. The facade is asymmetric with tower like masonry walls and small windows remembering Scottish baronial architecture. Address: Glasgow School of Art, 167 Renfrew Street, Glasgow, G3 6RQ, Scotland. DIMENSIONS 11in high, 6.5in wide, 2.5in deep and 7lb approximately. TAGS Glasgow School of Art model building. Glasgow Architecture. Charles Rennie Mackintosh. 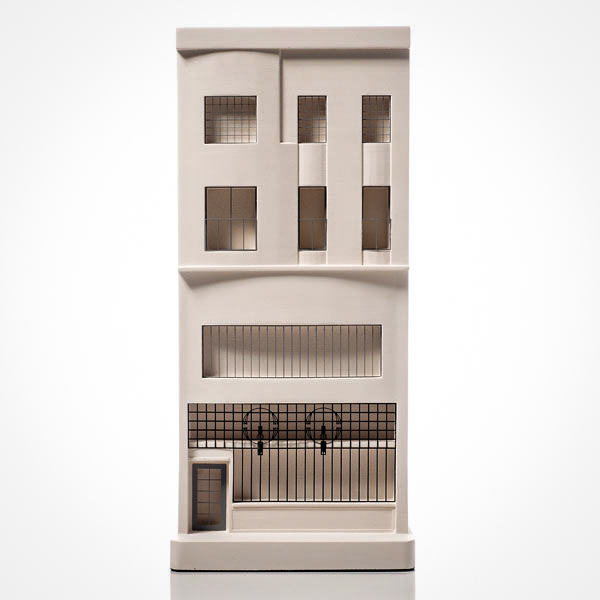 80+ Architectural sculptures / miniature buildings. Wall and desktop, bookend art inspired by architecture. Gift / Present architect. Buy direct from the maker. Handmade in Britain. Parcel arrived safely this morning...thank you.I would just like to say it is a magnificent and beautiful thing!You have captured the essence of the Bauhaus with accuracy and exquisite detailing, I think.This will occupy a very prominent position so that I can study its lines often. I'm much obliged for your care and attention. I just gave my father the model as a birthday present and his exact words were "It's absolutely marvelous." Keep up the good work; all of your pieces look fantastic.